When considering where to have your dumpster placed there are some items to think of: access to placement location, placement surface, and ease of loading. How will the dumpster get to location where you want it? For most people this is simple; on the driveway to one side. There are always some things to consider before ordering your dumpster: height clearance (low wires), turn radius of delivery vehicle, and width (most common if going through a fence). 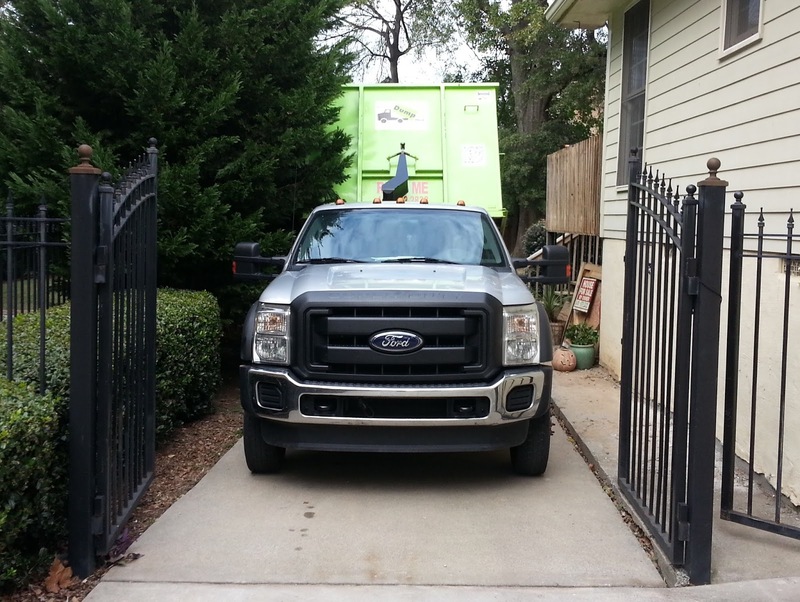 In order for Bin There Dump That Dumpsters of Atlanta/Marietta to access a drop location we need a min of 10’ height and 9’ width clearance; those requirements are lower than any of our competitors. When it comes to placement there are two main factors: slope/angle and surrounding hazards. Slope/angle has never been an issue for our dumpster system; the only thing we need to able to do is be parallel with the slope. A bin cannot be place at an angle or perpendicular to the slope. Surrounding hazards need a clearance of 5’ on the door end and 3’ on the sides. This ensures that we have a enough room to safely deliver and pick up all dumpsters. With Bin There Dump That Dumpsters the surface where the dumpster is being placed is an non issue. Whether it is being placed on a blacktop or concrete driveway we protect the surface 100% with custom boards (with stops) for the roll and rails; the bin never touches the surface. When a dumpster is placed on a solid surface there is a high probably of damage from the roller and rails during the dropping and pickup of the dumpster. Also, if the rollers and rails are in contact with the surface there is a good chance of rust stains. If you are going to have it placed grass, gravel, or other natural surface the trucks can cause minimal surface displacement to severe damage. Dumpster trucks can weigh 6 tons to 10 tons without any load! Yet again our truck are the lightest in the Atlanta/Marietta market and will cause the least amount of damage. Another thing to think about is the weather; if it has rained and ground is soft this increase the probability of severe damage. Loading the dumpster is extremely important. You want to make sure that you can open both (or at least one) doors and have a straight clear access to the loading end. Being able to open the door makes loading easier and prevents from having to lift items over the rim. Also, being able to walk into the bin makes it much easier to organize the loading and maximizes use of all available space. If you are in Atlanta, Roswell, Marietta, Kennesaw, Acworth, Powder Springs, Austell, Mableton, Dallas, Hiram, Lithia Springs, or Douglasville we access where no one else can. Furthermore, we are the only company to provide driveway protection and double doors for easy walk in loading. 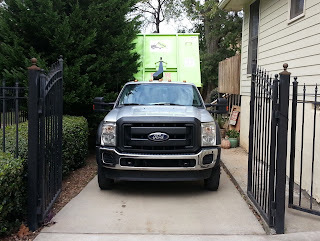 If you have any question about a dumpster rental we can be reached at 404-692-2838.